Operating Hours: Oct to Apr 10am-6pm, Tue - Sat; May to Sep 10 am-8pm, Tue-Sat; Sun and public holidays 10am-3pm. 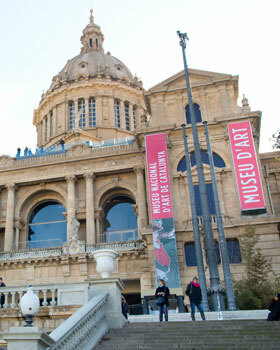 The Museu Nacional d’Art de Catalunya is located in the Palau Nacional of Montjuïc, constructed for the International Exposition of 1929. You can make a fascinating journey through the finest collection of Romanesque mural painting in the world to the splendour of Gothic art. You will also enjoy great European Renassaince and Baroque painters such as el Greco, Titian and Velázquez. From the Rooftops of the building you will enjoy one of the best panoramic views of the city.